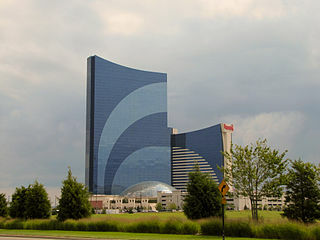 Harrah's Resort Atlantic City is a hotel and casino, located in the marina district of Atlantic City, New Jersey, and is Harrah's flagship casino. Harrah's has 177,000 sq ft of gaming space, with 2,722 slot and video poker machines and 139 table games. The poker room has 40 tables, and hosts an annual World Series of Poker event. With its sophisticated marina setting and infinite roster of world-class resort amenities, Harrah's Resort has become the premiere Atlantic City destination, boasting the tallest hotel tower and so much non-stop action, you'll wish your stay could last a lifetime.